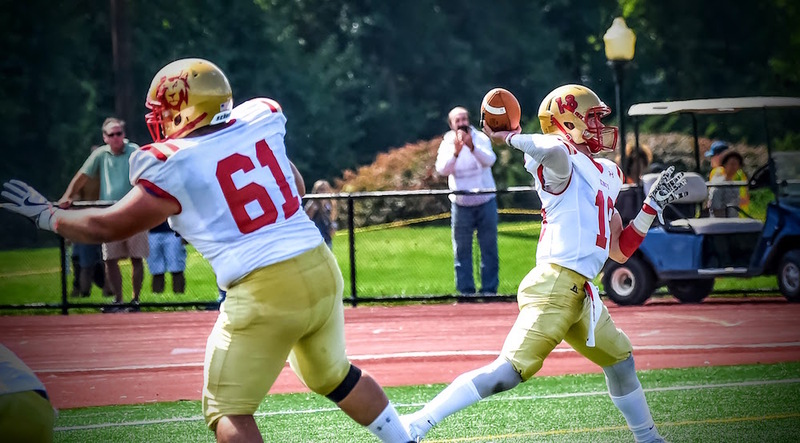 DALLAS -- The King's College football team put o the most productive offensive display in school history as the Monarchs posted a 63-37 victory over host Misericordia University Saturday Mangelsdorf Field. With the win King's evened its season ledger to 3-3 overall and 2-3 in Middle Atlantic Conference play. The Cougars, meanwhile, fell to 1-5 and 1-4 in league games. The Monarchs set single-game school records in the game in points (63) and total yards (655). The Monarchs scored 21 points in the first quarter while adding 14 points in each of the second, third, and fourth quarters. King's took the lead on the opening possession of the game when the Monarchs moved 59 yards in 10 play, picking up two important third-down pass conversions along the way. King's found the end zone on a 10-yard touchdown pass from Zach Whitehead to Tyler Marroni. Mike Tumminello added the point-after as the Monarchs took a 7-0 lead 11:56 into the game. 11 plays, 59 yards. After a Misericordia punt the Monarch struck quickly on first down with an 80-yard touchdown pass from Whitehead to Tyler Marroni. Tumminello made good on the extra-point to push the score to 14-0 with 9:40 left in the first quarter. Misericordia reached the scoreboard when Brady Williams found Mark Rainey down the right sideline for a 48-yard touchdown. Ryan Davis converted the extra point to cut the King's lead to 14-7 with 9:02 to go in the opening quarter. After the teams exchanged punt the Monarchs took over at its 12-yard line. King's used a 41-yard pass to Marroni and a 23-yard run by Jordan Downes to advance set up a three-yard touchdown run by Whitehead, extending the King's lead to 21-7 with 3:59 to go in the first quarter. Misericordia answered with a 67-yard drive, ending with a 36-yard field goal by Ryan Davis on the final play of the first quarter as the Cougars cut the lead to 21-10. The Monarchs countered with a nine-play, 59-yard drive, capped by a one-yard run by Titus Nelson as King's pushed the lead to 28-10 with 11:16 remaining in the second quarter. After forcing another Misericordia punt, King's stretched the lead to 35-10 when the Monarchs marched 61 yards on 10 plays, ending with a one-yard run by Downes with 5:20 left in the half. The Cougars answered when Williams found John Dieter with a 29 yard touchdown pass with 2:51 to go in the half as the Cougars cut the lead to 35-17 as neither team scored the remainder of the half. Misericordia took the second half kickoff and advanced 63 yards on three plays, culminating with a 34-yard touchdown pass to Isaiah Williams, trimming the lead to 35-24 with 13:16 remaining in the third quarter. King's quickly countered after assuming possession at the Monarch 49. On first down Whitehead found Trey Campbell for 47 yards down to the Cougar four. Two plays later Downes score from two yards out as the Monarchs pushed the lead to 42-24 with 12:01 left in the third quarter. After the Monarch defense held, King's fumbled the ensuing punt and Misericordia took over at the Monarch 31-yard line. Two plays later Williams hit Dieter for a 13-yard touchdown to trim the King's lead to 42-31 with 10:13 remaining in the third quarter. After the teams traded punts, the Monarchs again found the end zone with a nine-play, 64-yard drive, capped by an 11-yard touchdown run by Whitehead to give King's a 49-31 lead with 4:23 to play in the third quarter. The Monarchs defense forced another Cougar punt and King's added yet another score when Whithead capped a 75-yard drive with a 41-yard touchdown pass to Marroni. Tumminello's point-after kick pushed the King's lead to 56-31 with 12:44 left in the contest. It was Marroni's third touchdown reception of the day. 6:05 to play. It was the longest run from scrimmage in King's history, breaking the previous mark of 80 yards set by John Ortiz against Albright in 2005. Misericordia would add a five-yard pass from Williams to Dieter with 3:37 on the clock bu the two-point conversion failed to set the final score at 63-37. Misericordia finished with 357 total yards in the game. Williams completed 17-of-27 passes for 263 yards and five touchdowns while also rushing for 67 yards on 23 carries. Dieter had six catches for 86 yards and three scores. Mando Sallavanti led the King's defense with 11 tackles while Bruce Damon and Chris DeGaetano had seven tackles apiece. Next week the Monarchs take on its biggest challenge of the season when King's travels to face MAC leader Delaware Valley University. The Aggies knocked off Albright 41-6 in a battle of unbeaten MAC co-leaders on Saturday. Delaware Valley stands at 6-0 overall and 5-0 in MAC play and entered the weekend ranked seventh nationally in NCAA Division III by the American Football Coaches Association. Kickoff is at 12:30 PM in Doylestown.